Unforgiving cold has punished the eastern United States for the past 10 days. But the most severe winter weather yet will assault the area Wednesday night into the weekend. 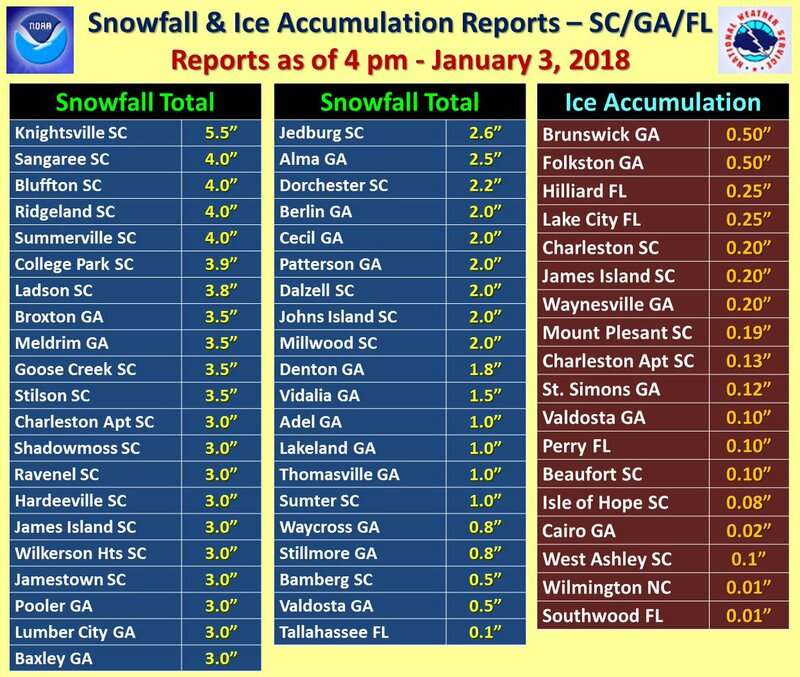 First, a monster ocean storm is taking shape, which pasted parts of Florida, Georgia and South Carolina with rare ice and snow early Wednesday. By Thursday, the exploding storm will, in many ways, resemble a winter hurricane, battering easternmost New England with potentially damaging winds in addition to blinding snow. Blizzard warnings have been issued for the Virginia Tidewater region up the coast to eastern Maine, including Ocean City, Atlantic City, eastern Long Island, Boston and Portland. “This rapidly intensifying East Coast storm will produce strong, damaging winds — possibly resulting in downed trees, power outages and coastal flooding,” the National Weather Service tweeted Wednesday. National Weather Service hurricane hunter aircraft are even flying into the storm to gather data and refine the forecast given the possible severe impacts in coastal areas. In the storm’s wake, the mother lode of numbing cold will crash south — likely to be the last but most bitter in brutal blasts since Christmas Eve in the Northeast. The storm took shape off the coast of Florida on Wednesday, unloading hazardous snow and ice in highly unusual locations not accustomed to such weather. It is next expected to rapidly intensify, buffeting the Mid-Atlantic beaches and eastern New England. From Norfolk to the Maryland and Delaware beaches, under blizzard warnings, at least 5 to 8 inches of snow is predicted, with as much as a foot possible between Wednesday evening and Thursday afternoon. The combination of wind gusts up to 50 mph and heavy snow could cause whiteout conditions. It is only the second blizzard warning for the Virginia Tidewater since the 1980s. Farther inland in the Mid-Atlantic, near Interstate 95, up to an inch or so could fall in Washington and Baltimore, but more in their eastern and southeastern suburbs, where several inches are predicted. To the north, Philadelphia and New York are both under winter storm warnings late Wednesday night through Thursday for 5 to 8 inches of snow and wind gusts up to 45 mph. East of Philadelphia and New York, predicted snow amounts and wind speeds increase. Atlantic City is expecting 6 to 10 inches of snow and wind gusts to 50 mph, while eastern Long Island may endure 8 to 12 inches of snow and 55 mph gusts. Specific amounts up and down the coast will depend on the exact storm track. If the storm tracks closer to the coast, snow amounts and peak wind gusts will be higher and extend farther west. But if the storm wobbles east, snow amounts as well as peak winds will decrease. By the time the storm reaches the ocean waters off eastern New England on Thursday, it will have explosively intensified and become a more severe storm. Its central pressure will have fallen almost 50 millibars in just 24 hours — an astonishing rate of strengthening. It is this drop in pressure that will cause winds to really crank up in eastern New England, up to 60 to 70 mph along the coast. Winds will be considerably stronger over the ocean — exceeding hurricane force — where enormous waves will form. In Boston, the Weather Service is forecasting up to 14 inches of snow Thursday, along with 60 mph wind gusts strong enough to bring down branches and cut power. In both eastern Massachusetts and Maine, the combination of potentially damaging winds and heavy snow is expected to cause whiteout conditions and significant drifting of snow. Thunder could accompany the snow and fall at a clip of up to 2 to 3 inches per hour. As the wind and waves slam into the shore, coastal flooding is forecast Thursday late morning and afternoon, raising seas 2 to 2.5 feet above normal, with “moderate to major impacts,” according to the Weather Service, inundating shore roads and basements. “In a few spots, sea ice chunks may exacerbate damage,” it said. The Weather Service expects to snow to result in “extremely difficult” travel, but it is most concerned about the power outage threat and the bitter cold predicted to follow. Most locations in the Mid-Atlantic and Northeast are predicted to set records for cold temperatures Friday, with highs in the single digits and teens. On Saturday morning, subzero cold is forecast over almost all of New England, with single digits in the Mid-Atlantic. Finally, after one of the most intense cold spells of such duration on record in parts of New England — including Boston — temperatures are forecast to thaw by early next week.